Becoming The Guardian by Automatad, Inc. The persistence and individuality of the publisher are inspiring. It’s not easy to sustain and grow your presence across the globe while battling against the downward sloping revenue graph. In fact, The Guardian’s survival was in question a few years back as the publisher was burning cash consecutively and on the verge of going bankrupt. But now, it’s in the path of breaking even by 2019. Leaving aside the printing business (as we’re no way gonna go back), let’s talk about how The Guardian has grown its ad revenue over the years. Discretion: We will mention the data for The Guardian Media Group GMG (the parent company), The Guardian News & Media Limited GNM, the subsidiary which owns two newspapers (The Guardian and The Observer) aside from the news website, theguardian.com. We have to extrapolate occasionally to complete the article. It is understood that the digital investment has also contributed to total digital revenue generated by the Group. Back in the day, the online newspaper industry was nascent. But ‘Guardian Unlimited’, a news website of the Guardian, has reportedly attracted millions of visitors each month along with other titles (MSNBC and CNN Interactive). 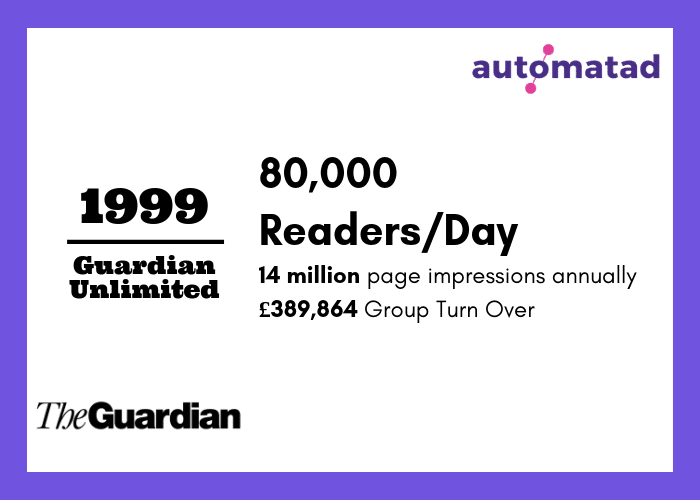 To be specific, Guardian Unlimited had around 80,000 digital readers each day, which is roughly a quarter of its print circulation. The page impressions were over 14 million/year and noticeably, revenue has grown by 500 percent year-on-year. The total digital advertising revenue was already around a few million dollars, thanks to the investment on digital newspaper ‘Guardian Unlimited’ and stake on Fish4Sites. In case you’re wondering how the publisher managed to garner millions of readers every month when the Internet itself was in its infancy, it’s because of the credibility and investment. The Guardian Newspapers had a massive readership in the UK and the company has been building authenticity for over a century. When it came to the hand-held devices and PC, readers didn’t hesitate much to give it a try. The Guardian Unlimited dived into the digital media to capitalize on the market. It didn’t turn back to invest on the Internet. The Guardian Media Group’s digital ad revenue totaled £141.89 million last year, which is higher than the print advertising. Two-thirds of the total digital audience is not from the UK. The US accounts for 20 to 25 percent of the total traffic. The number implies the growth of the publisher across the globe, not just in the UK. The Global Monthly Impressions of theguardian.com is 528,293,401 (528.3 M). And, the Global Monthly Unique Browsers are over 84M. The daily unique browsers across the globe are over 4M (Src). How’s the Hockey Stick Graph? As you could see, the publisher has grown its ad revenue by more than 100x and traffic by more than 35x in the last decade. However, if you put the data (total advertising revenue/turnover) over the years on a chart, you won’t get a clear hockey stick. That’s the best part. The Guardian had its own battle to cut down losses and increase revenue. The ascent of other online newspapers tightened the belt for The Guardian. So, how did they manage to head back into the black? And, what strategies did they implement to grow advertising revenue? For eloquence, we’ve compartmented the story into four sections. Back in the day, online newspapers were baffled about the potential of advertising on the Internet. That being said, you could count the number of online newspapers putting up paywalls every day. But, the Guardian wasn’t a fan of paywalls, even back then. So, what happened next is a bit interesting. Times Online led the charge, by charging the readers. It started to collect an annual fee of $67 for overseas users in 2002 and it turned profitable the next year. Financial Times, one of the earliest online newspapers has also started to put up a paywall during the same period and they’ve also attained profitability soon. Of course, both had their own tiered pricing models and a free-content section to keep the advertising revenue afloat. Unlike others, Guardian Unlimited pursued the value-add model. The publisher didn’t charge for the majority of its content and even, archives (the obvious opportunity to ask for the money). But, it came up with a new set of services, starting from news updates via mobile to the digital edition of the Guardian newspaper. The publisher charged just 35 cents for mobile updates and $165 a year for newspaper digital edition (Src). Besides, it allowed subscribing for everyday email roundups and crossword. It’s free for the commons and if you’re a dedicated Guardianista, you can pay for the value-adds. The move was idiosyncratic, but it did deliver the results. On an interview with ‘Online Journalism Review’, then Editor in Chief, Emily Bell revealed how the publisher is thinking on decades, not just on years. Don’t you think the downfall of newspapers and others digital ad revenue (because of the paywalls) are self-evident? Other big titles put up a paywall, the Guardian capitalized on the situation, even when it means the risk of losing everything. In fact, Nielsen/NetRatings reported that the Financial Times unique user numbers dropped from 604,000 in May 2002 to 463,000 in June, right after the introduction of paywalls. 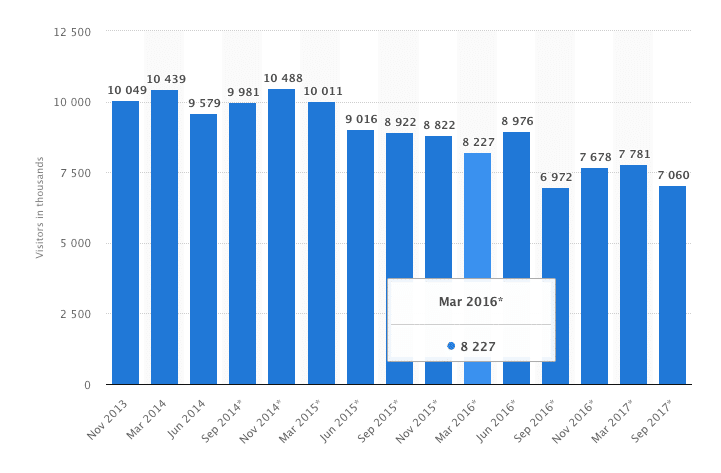 Just after two years, Guardian reached 9 Million unique users and 100 Million impressions a month (Src). Those who sow will reap. 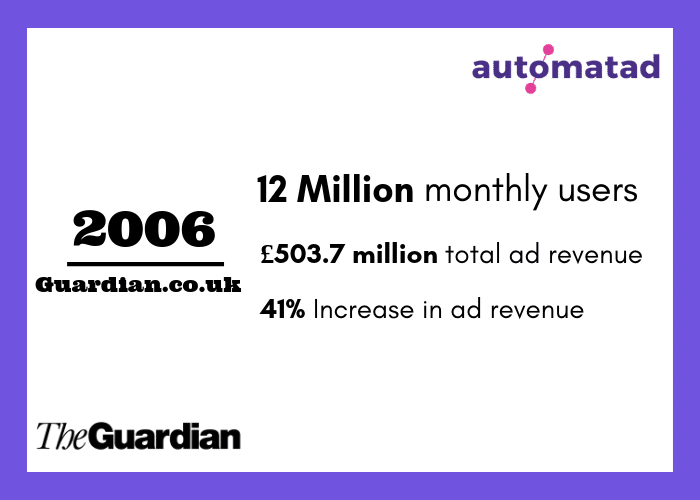 For the first time, Guardian.co.uk reported that 2006 is a profitable year and income is mostly from display advertising and recruitment advertising (Src). The total advertising and media revenue hit £503.7 million. 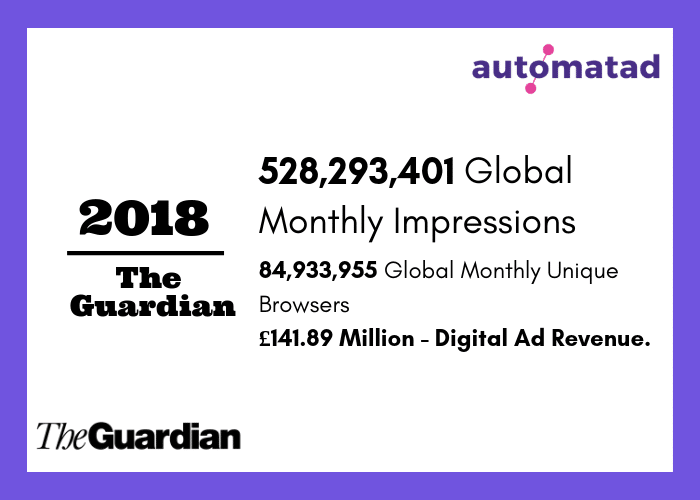 The group didn’t discern the digital ad revenue from the guardian.co.uk, but it mentioned the year was record-breaking in terms of both traffic and revenues (The revenues skyrocketed by 41%). The profit of the website was £1 million, as per Press-Gazette. The reason behind is the free content and exponential reach. 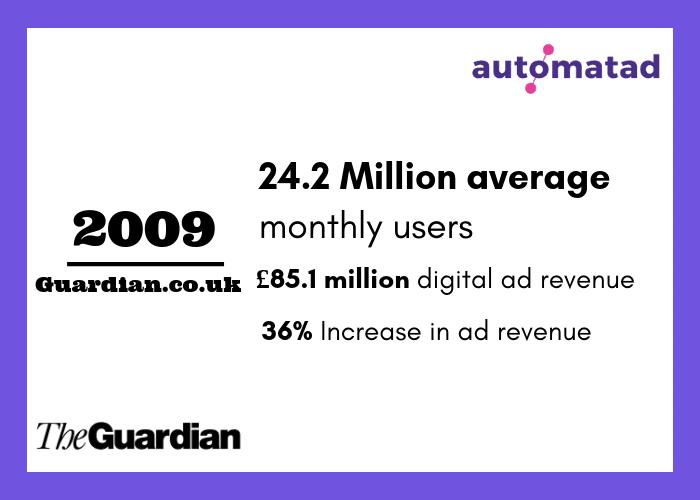 At the end of 2005, Guardian Unlimited has attracted over 12 million monthly users (the number was just over 9 Million a year back). It took 7 complete years for one of the strongest online websites to reach profitability. The profitable year was pretty busy for the publisher. The first collective comment blog by a British Newspaper was formed – Comment is Free. It might not sound so exciting for us today, but the Guardian has been known for attracting readers with its long-running talkboards and network of weblogs. The new comment section merges all the seven blogs and invites everyone to converge at the same place (Src). Following the success, guardian.co.uk begin a one and half year process of revamping its website. The plan was to include additional features, new front page, community updates, new travel section, and others. It was well worth the effort. It has become the first UK newspaper to attract more than 25 Million unique readers in a month (October 2008). The Guardian’s time in the black ended quite shortly. The group was burning cash from 2008 and it still does. GNM (Guardian News & Media), the division that holds the Guardian and the Observer lost £36.8 million, which is higher than the previous year (Src). Noticeably, the decline was due to the worst financial market conditions and the downfall of print newspapers. Indeed, it wasn’t the only newspaper to bleed cash. Though the print circulation was declining, the growth of digital businesses is consistent. In 2008, the group-wide digital revenue soared by 36% to reach £85.1 million and average monthly users increased by 32% to hit 24.2 Million. During the same year, Guardian Unlimited website relaunched as ‘guardian.co.uk’ and around £19 million (at the time) was invested to improve design, functionality, and usability. As the publisher saw the clear growth of digital advertising, they didn’t think twice to invest. The decline in print recruitment advertising revenues was offset by a 49% increase in digital recruitment revenues (Src). *The turnover dropped to £502.1 Million from £716.1 Million. Sidenote: The group’s 2008 profits were inflated by the one-off proceeds of selling 49.9 percent of Trader Media Group, publisher of Auto Trader. To put the impact of the year into perspective, the group was looking to sell or seal the Observer newspaper business – The world’s oldest Sunday newspaper (Src). GNM also launched ‘Guardia America’ to procure US audience. The spin-off was focused on delivering US-based content along with others and it has partnered with Reuters for advertising. You can see it as the start of partnerships between publishers to form the quality ad environment for buyers. Now, we’re doing it through PMPs and Ad Exchanges (TrustX). However, GuardianAmerica.com was abandoned in October 2009 as the publisher found the site was confusing for readers (mainly because of duplicate content and some non-US readers ended up on the site due to social media) (Src). The publisher knew there is a wide-window open to attract sports fans. And, as per the plan, The Guardian Sports section has been attracting millions of visitors every month and now regarded as the ‘digestible and up-to-date’ news providers for different sports. From Premier League Football to FIFA Cup to La Liga League Cup, The Guardian’s sports section covers everything and provides live text commentaries. The strategy is to capitalize on the opportunities provided by the growing Internet community. And, by 2009, guardian.co.uk would have reached 30 Million unique users across the globe (Src). The Guardian Media Group continued to stay in its losing streak and reported an operating loss of £171.0 Million (at the time). This has pushed GNM to revisit the paywall strategy. But the publisher stood its ground. On the other hand, the reach of guardian.co.uk keeps growing and as of August 2010 it was the second-most popular UK newspaper website after Mail Online, getting almost 34.6 million unique users monthly, and 13.7 million unique British users monthly (Src). The Guardian took in $49.27 Million in digital revenue in 2010. Using the December ABCe number of 39 million uniques, each unique was worth about £.96, or $1.53* (Src). *The exchange rate was calculated on Aug 5, 2011. Andrew Miller, who has been appointed as the CEO of the Guardian Media Group took an enormous task of reviving the publisher and growing its digital revenue. To put it simply, he kept his promise. During his tenure, he consistently improved the digital ad revenue while maintaining the paywall-free business model (It wasn’t easy). The traffic was also consistent throughout the period. By May 2011, guardian.co.uk reached 2.8 Million unique visitors per day, and 51.3 Million per month, just behind the Mail Online (Src). The year also witnessed ‘Guardian US’, a New York-city based American online presence of the publisher. The global presence of the publisher doesn’t mean it’s showing consistent growth on the home ground. However, the publisher is still able to retain most of its reader base (we’ll look at the 2018 data later). Despite the pressure of declining print revenues and cutting losses, Guardian never lost consciousness of who they are. The publisher believed layout is a matter of choice. And, considering the rise of mobile devices, guardian.co.uk continually prioritized user experience than ad revenue. The investment on the website didn’t stop even with the losses plaguing the publisher. The Group streamlined itself by selling off its stake in Auto Trading Group, Radio Group, and directed the cash towards the growth of digital advertising and International Expansion. 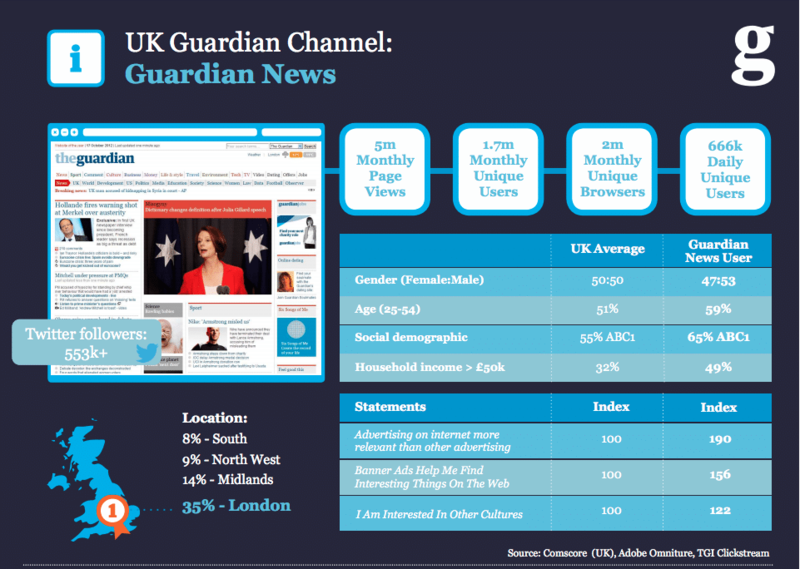 As a part of its expansion, the publisher moves from guardian.co.uk to guardian.com on July 30, 2013, depicting the interested towards the world-wide audience. And, today guardian.com has more traffic from the US than the UK. The ad revenue from the global market justified all the investments made by the publisher and 170+ staffs it employed. If you talk to the industry prognosticators about the Guardian, they’ll mention that the publisher is lacking dominance over the specific niche or national. For instance, the Guardian attracted millions of visitors across the globe but didn’t have a prodigious market share from the UK or from any other part of the world. The visitors from the UK remained around 10 Million for the period of three years (2013 to 2016). As you’ve guessed, the internet users and online readers were growing exponentially during the same period. Hence, the Guardian decided to divide the verticals and conquer them with specific strategies. The publisher categorized its channels and formulated separate pitches and editorial teams to personalize the messages and to increase the advertising ROI. Yet another important decision, the Guardian has made is to scratch the traditional sales approach and create a new sales-model which capitalizes on the commercial credibility. Ken Doctor, a news industry analyst cites the high-level engagement with top brands and agencies like telco EE and Unilever, and induction of the Guardian Labs are the major reasons for the continued increase in digital revenue (Src). It has become viable for the publisher to devise, implement, and measure results for its campaigns throughout the Guardian outlets. In case you didn’t know, the Guardian has an in-house analytics tool named “Ophan” to measure and analyze the performance of their stories, Social Media statistics, and more. If you’ve been wondering how the publisher has been able to partner up with the big advertisers and improve the campaigns’ ROI substantially, Ophan is what you need to be aware of. Ophan, which has been around since the beginning of this decade served exceptionally useful for both in-house and advertisers’ content. Starting from headlines to CTR to attention time, the tool displays everything visually. The Guardian has always been open to change and tries to improve the experience for its audience. When Facebook announced Facebook Instant Articles, The Guardian become one of the two publishers (Other one is BuzzFeed) to try and see how it goes. After testing the IA pages over a year, The Guardian has called it off, saying the readers need to be on our site to reach our journalism (and revenue goals). The same happened to Apple News. In fact, the publisher was one of the first-hand testers of the Google AMP project. As it has proved worthy, the Guardian has AMP version of its articles till today. It understands the need to have visitors on its own platform and that’s why the IA pages and Apple News were dropped by the publisher. It’s essential to experiment, measure, and extrapolate before making any decisions. – The Guardian, March 2014. As we said above, the Guardian isn’t reluctant to experiment. After all, you can know only when you’ve tried it yourself. There’s no one-size-fits-all solution in the ad tech and the publisher knows it well. 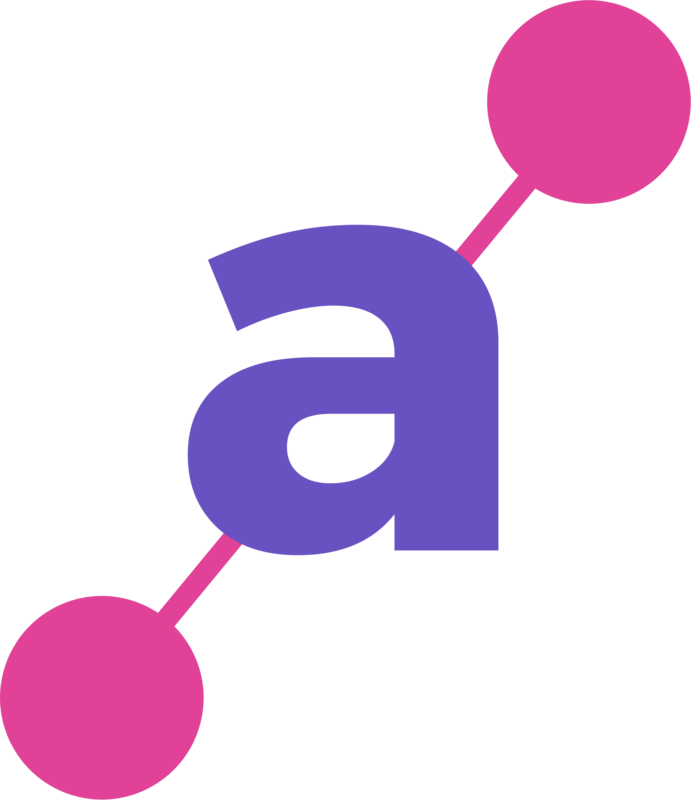 It began exploring the RTB and programmatic ad selling techniques, though the concept was new and successfully implemented ‘header bidding’ in 2016 (Src). In 2016, only a handful publishers believed it’s worth a shot and the Guardian proved it right. Daniel Spears, Director of Programmatic Sales of The Guardian, said that programmatic is expected to reach 100% of the digital display revenue generated by the publisher. As underlined above, programmatic sales have to evolve to continue growing their ad revenue and get some big advertisers to the publisher. The publisher trains the salespeople to be data crunchers and consultants rather than marketers. “The capacity to interpret data and analyze it via the complex technology that underpins programmatic sales. Salespeople will be expected to have sophisticated investment conversations with a customer who is akin to an institutional investor”. a. Predefined: off-the-shelf segmentations, which defined by combinations of demographic factors, interest or other characteristics. b. Advanced custom audiences: leverages data science to deliver bespoke and self-optimizing audience segmentations to individual advertisers. “The data that an advertiser can collect is often limited in scope and scale. They need quality data as means to recognize incremental audience opportunity, and so there is increasing advertiser interest in publisher’s audience intelligence”. It even developed a proprietary ad product with the help of its in-house analytics tool. Dubbed as “Pulse”, buyers can place ads on the surging stories of theguardian.com. Stories which are procuring 300 page views per minute will be made available in an auction environment and buyers can bid (only above the preset floor price) to get the impressions. We all know ‘Google Ads’ and ‘Google Ad Manager’. But do you know ‘The Guardian Ad Manager’? Much like Google Ads, The Guardian Ad Manager is developed to cater SMEs (in the UK). Any advertiser can reach 160+ Million unique browsers (The Guardian digital audience) with the help of the ad manager. It has the minimum budget of £300 and it’s been in beta since Sep 2017. – Nick Hewat, Commercial Director, The Guardian. This June, The Guardian partnered up with other UK titles such as The Times, The Sunday Times, The Sun, and The Daily Telegraph to form an ad network to offer fraud-free, first-party powered ad impressions to the advertisers. The project is named as ‘The Ozone Project’. And, the latest update from the project says that the group is devising a technology to put publishers back in control of everything including ad tags. 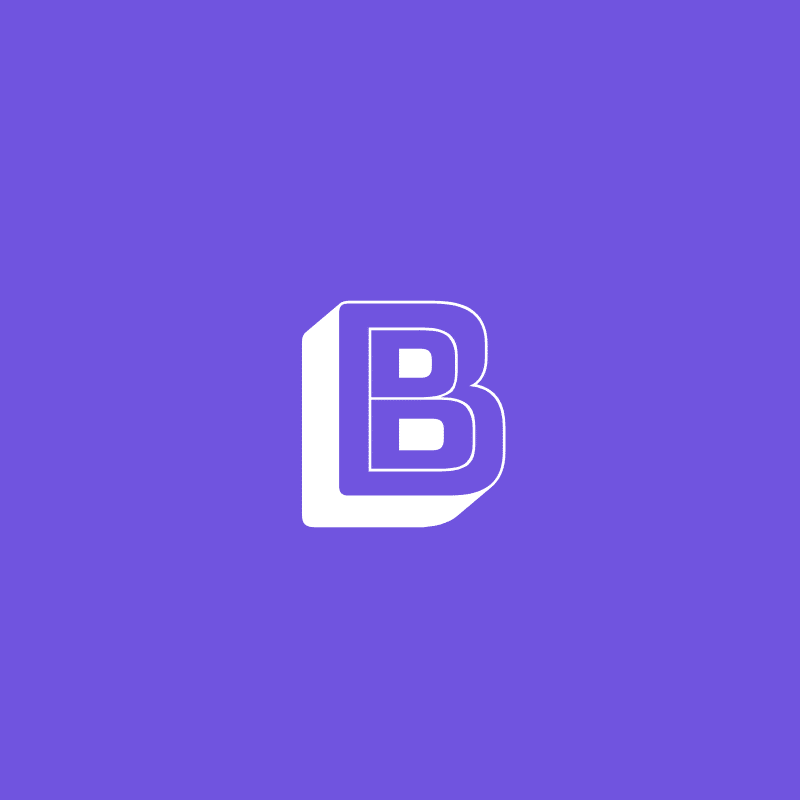 The purpose of the becoming series is to expose the struggles and strategies of a publisher so that you can learn the pitfalls and make informed decisions. Though the Guardian has an enormous audience across the globe, it still isn’t in the black. This implies publishers (regardless of traffic) have to deal with more than what meets the eye. The duopoly is just the part of the game and you need to go beyond to continue doing what you do. The Guardian understands it well. From its own ad manager to publisher-partnerships, the Guardian has never failed to meet the demand. – David Pemsel, GMG chief executive. Let us know what do you think about the progress of the Guardian in the comments below. Have any questions, jot them down.